Performa likes to keep its crowd guessing. And as usual, its annual fall gala offered plenty of surprises throughout the night. This year’s event at Stage 37 honored iconic land artist Christo and his late wife Jeanne-Claude who, over the course of many decades, created ambitious large-scale environmental works. As an homage to the duo’s work, the stated dress code of the night was “fold,” and many in the crowd obliged. Christo maintains that what went into his projects is a lot of work — real work. For their “The Gates” project, which was documented by the late Maysles brothers, he had to talk to many New York politicians until he was able to realize the plan of erecting 7,503 saffron-canopied gates inside of Central Park. The climbers scaling the railing inside the event space were, however, real performance artists. So were the performers tethered to buckets inside the venue’s entrance. The crowd included artists of many stripes, from the up-and-comers to the more established, including Ellie Goulding, Rashid Johnson, Derrick Adams and David Hallberg. No matter how Christo chooses to define his work, the fact is that he’s part of the fabric of the larger artistic cannon. 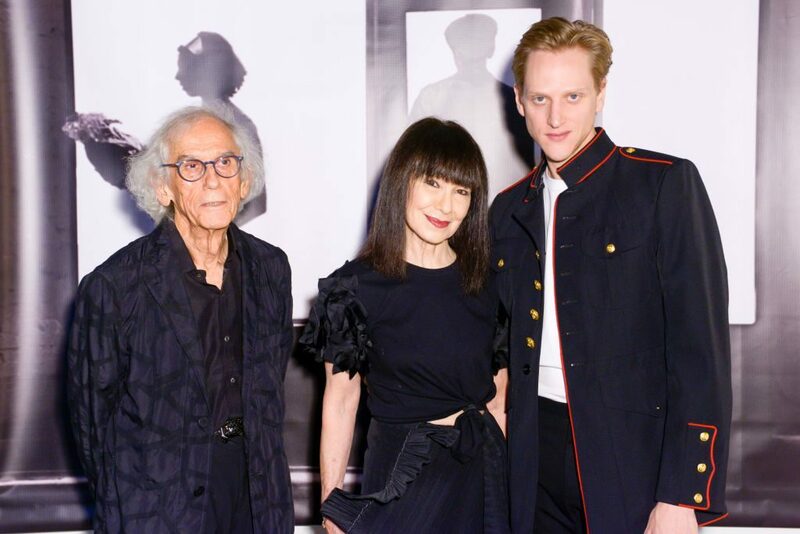 “I’m always astonished by people who’ve managed to sustain a position, a level of ingenuity and inventiveness and creativity that over six decades, it’s huge,” said Performa founder RoseLee Goldberg, who met Christo in the Seventies when she was working in London and described his work as “democratic.” “One of the points I’ve been trying to make ever since I wrote my first book in 1979, but also with Performa is that performance has been around for centuries, it’s not something that suddenly new,” she added. What Performa attempts to do is add an element of newness to the gala scene. Case in point: when the crowd sat for dinner, surrounded by projected images of Christo’s work, the appetizer in front of them was yogurt and onion: Christo’s favorite breakfast. Each item served throughout the night references the art duo’s projects: Mastaba, Boulders, Islands, Trees, Apostrophe. As buckets of silent disco-style headphones were passed around ahead of an evening of performances, Goldberg offered the crowd another word: V-O-T-E.